Please read this heartwarming story about one of Fonthill Animal Hospital’s very own patients! John Lennon in his song Beautiful Boy-(Double Fantasy Album) sang “Life is what happens to you while you’re busy making other plans”. June 27, 2011, my beautiful boy Blazer Ch. Pewteredge Blaze of Glory NSD, TT, TDI, CGC had crossed to the Rainbow Bridge and I was in the most unimaginable place – for 3 days I was curled up in a ball, sobbing, cursing the sun for shining and the birds for singing, when from my perspective, the world had ended and everything should be plunged in the deepest darkness. I was a mess. 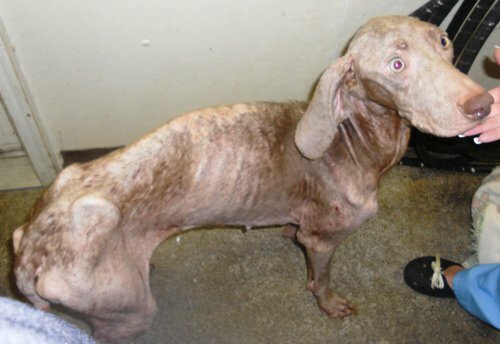 My other animals were neglected, my family and friends concerned for my sanity, when I received a call for help from a rescue transport group (Open Arms Pound Rescue on the Ohio/Indiana border) to find a rescue and foster home for a severely starved and abused weimaraner who came to be known as Mercy, the Mercer County Weimaraner. One look at those pictures, and I was busy asking my friends to chipin to Mercy’s Vet Care in memory of Blazer. Four days later, over $1400.00 had been raised with donations received from as far away as the Netherlands and Australia. 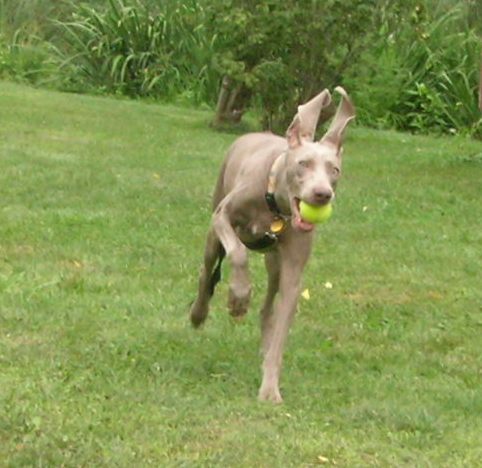 NYS Weim Rescue volunteered to be Mercy’s sponsor and since I was down one dog, I naturally agreed to foster Mercy. My poor weim Zest was missing her big brother, was lethargic and I thought having another dog around would perk up her spirits. Mercy had a long road to recovery before Open Arms would be able to transport her to Ontario. 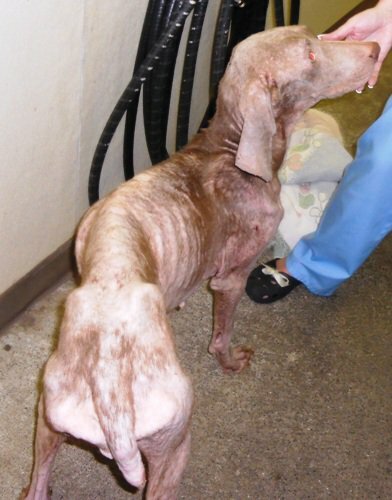 A walking skeleton, hairless, neglected, covered in sores and scars, miraculously she was heartworm negative and appeared not to have damage to her internal organs. Mercy was in good hands in Ohio, was gaining weight and was appreciative of the love and care given by her foster family. And then Life happened again. I lost Zestie to cancer 5 weeks after Blazer had died on August 8th. My shoulders weren’t broad enough to handle this double tragedy. I needed an Angel of Mercy……. Open Arms fast tracked Mercy’s spay and gastopexy and we picked our Angel up in Oakville on August 20, 2011. I have now joined the ranks of the group affectionately known as “foster failures”. Mercy has integrated well into our family. She is best friends with our Siamese Cat Tommy, our neighbours GSP Zia, and has learned to leave the chickens and ducks alone. A little wary of strangers, especially hooded men, Mercy enjoys daily hikes and jogs in the surrounding hills and vineyards with the children and I. 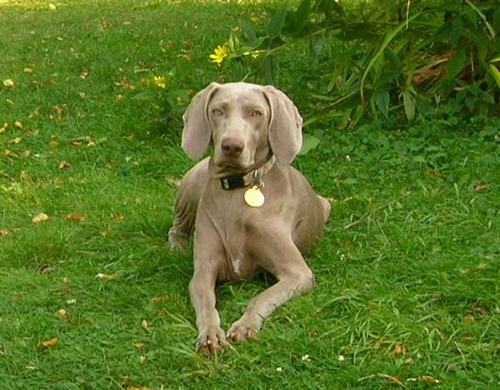 That skinny, formerly abused weimaraner is a food thief, a comic, a joy! There are many ways we can help to save dogs lives. Consider volunteering to help transport dogs to their new homes; become a foster; contribute financially. Not only are you helping a dog in need, you just may be helping a human shoulder the load………. My angel of Mercy helps me every day.